Winter time is usually the time when we want to only wear pajamas and cuddle up under big cozy blankets and watch Netflix all day. Unless you are working from home, most of us girls can’t do that everyday. The struggle is real, I know. Just because it is winter, we can’t feel demotivated to get dressed in the morning. We just need to find ideas on how to dress without looking frumpy or looked like a big ball of yarn. One easy way to still look stylish during the winter is by layering. Layering is such a big trend right now, and it’s a very practical way for us to stay warm. You can pile on sweaters over sweaters, but keep in mind that if you’re not careful, you’ll look too bulky and not very flattering. So on this week’s tip Tuesday, I’m gonna show you how you could layer up this winter season, while still keeping yourself warm and toasty. For this first look, I chose a casual everyday look. I picked a chunky turtleneck sweater in a more neutral shade to be worn on top of the striped turtleneck top. Since the striped turtleneck is thinner, it is perfect for layering under a thicker, warmer material. Jeans are always a good option and I love wearing parkas in the winter time for that casual vibe. Chelsea boots are very stylish and laid back for a casual look too. For my office girls, you could still look really sophisticated with layering too. Wear a thermal tee (like this one from Uniqlo) under your work shirts for that extra warmth. You could also wear a pair of thermal leggings under your pants if it gets really cold. A nice fitted coat would make your whole ensemble look polish and professional. Don’t forget the shoes, heeled booties always look chic with pants. If you want to accessories more, opt for a pair of leather gloves to keep your hands warm and a thick scarf tucked under your coat. Tired of wearing jeans when you go for date nights during the colder months? Don’t you worry now. 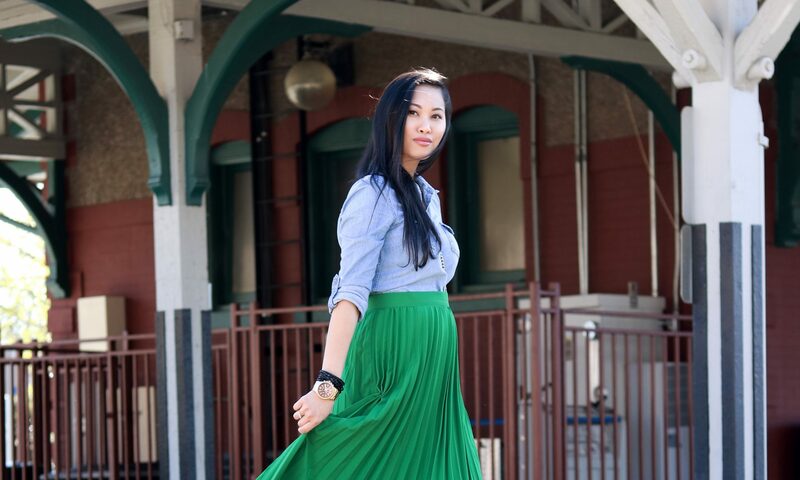 You could wear your favorite skirt, or dress on date nights too. Again, it’s all about layering. Layer a button up blouse or shirt of your choice under a cropped sweater for warmth. Choose a skirt with a thicker material like corduroy or faux leather and wear a pair of wool tights underneath to keep your legs warm. I like a leather jacket just to add a little bit of masculinity to this girly look. And over the knee boots would be the cherry on top. Plus, your legs and feet will be extra toasty warm through out the night. I hope this will give you some ideas on layering or how to layer with the clothes you already have in your closet. You could repurpose your summer clothing to wear during winter or you could buy basic winter essentials and find creative ways to pair it with your other outfits. Love all of these looks! I love finding pieces in my closet to layer in different ways. Great post! I love your date night pick! I love wearing skirts and dresses. Very stylish, I’m loving all three! Great tips! Wow I love all three! So much inspiration 🙂 Great post!